Whenever George Wallace comes to New York, he always comes back to his “home” to visit Richie Tienken and The Comic Strip. That’s the place where he started back in 1976, before the place was even finished. 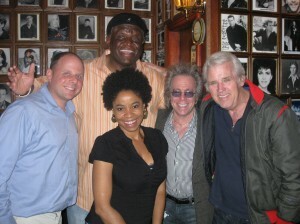 (L-R) J.R. Ravitz, Marina Franklin, Jeffrey Gurian, and Richie Tienken, and holding down the back row by himself, is George Wallace! George is so big, he’s his own row! 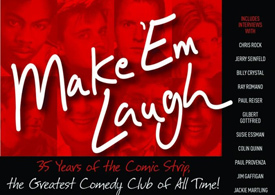 It was the reason when Richie and I did the book on the 35 year history of the legendary club, we were originally planning to call it “Eat, Drink and Laugh”. George and Jerry Seinfeld were and still are best friends. They were roommates in the early days and shared an apartment on West 71st Street. When Jerry left for LA, George kept the apartment and roomed with Paul Provenza. 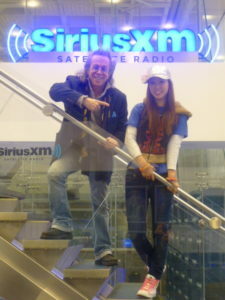 George has been in Las Vegas for the last ten years with the highest rated 10 P.M. show on The Strip. 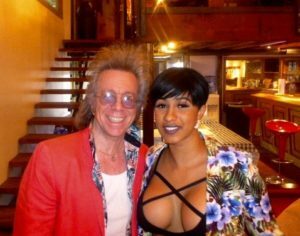 He came into The Strip to do a set recently, which thrilled the crowd, and told me he’s thinking of moving back to New York. George was the second interview I did for the book “Make ‘Em Laugh”, up in Montreal during the Just for Laughs Festival in Montreal, the summer of 2008. 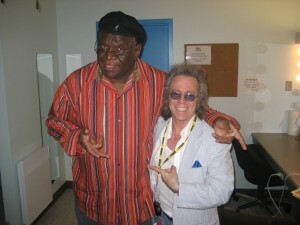 Jeffrey Gurian of Comedy Matters TV with George Wallace backstage during rehearsal at the Just for Laughs Festival in Montreal, 2008! He was hosting one of the huge galas that gets televised, and right before he went out on stage he asked me what I thought he should say! I had to laugh to myself that here was a guy, so accomplished that he didn’t even have to prepare to host a major comedy gala and would decide what he was going to say when he got out there! 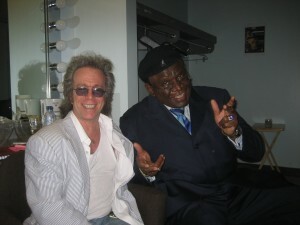 Jeffrey Gurian of Comedy Matters TV backstage with “All Star Gala” host George Wallace just before he took the stage! Needless to say he killed it and after the show he took me out for a late dinner, where I did my interview, and we got to know each other. We’ve stayed in touch ever since. 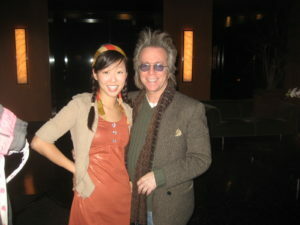 I’m one of the producers of a new comedy documentary film called “The Business of Comedy” Exec. Produced by two great guys Gary Licker and Scott Sobel of Scott Entertainment. They went out to Vegas to interview George, and I gave them a signed copy of the book to bring George as I knew he hadn’t seen it yet. They were thrilled to do it and they said that George was thrilled to get it. 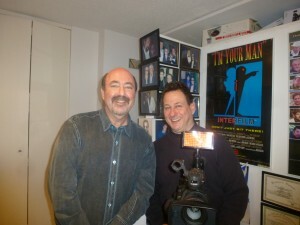 Scott Sobel and Gary Licker, Exec. Producers of the doc. 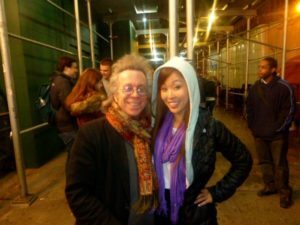 film “The Business of Comedy” at the home of Jeffrey Gurian, filming him for the doc., on which he is also a co-producer! One of the first things he said when he saw me was how much he loved the book! So I was backstage with him this time too, and don’t you think that right before he went out to perform he asked me what I thought he should do! (LOL) I reminded him of the incident in Montreal and told him that whatever he chose would be perfect. The audience was already his! 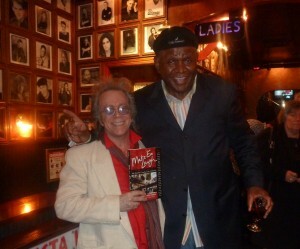 Jeffrey Gurian of Comedy Matters TV with George Wallace at The Comic Strip! He talked about going to Oprah’s party, and talked about getting parking tickets. He said he got so many parking tickets he was thinking of removing his windshield. That’s hysterical! He also told of the dyslexic cop who gave him an IUD, instead of a DUI! He talked about his poor childhood and how in his day kids only got measles, mumps and chickenpox. It was all they could afford! 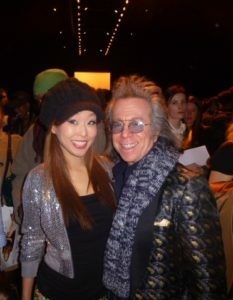 George hung out after his killer set, and took photos with his fans and with Richie and I. It was very cool night and if he does move back to New York, you can bet he’ll be a regular at his old home, The Comic Strip! 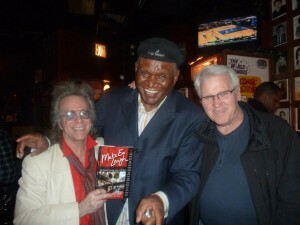 (L-R) Jeffrey Gurian of Comedy Matters TV, George Wallace and Richie Tienken at The Comic Strip, holding the book ” Make “Em Laugh” about the 35 year history of the club written by Jeffrey Gurian and Richie Tienken! George is featured prominently in the book as one of the originals from The Strip!